Wild-card weekend once again proved to live up to its reputation as one of the most galvanizing weekends in all of sports. There were defensive battles, offensive onslaughts and, of course, the return of Tebow Time. Houston 31, Cincinnati 10: In their first go-around, Texans rookie quarterback T.J. Yates needed to rifle a last-second bullet to Kevin Walter to lift his team to victory. 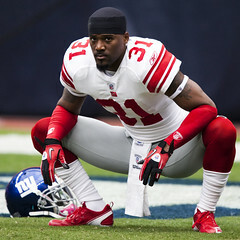 This time around, he sat back and let his running back and defense do the work in his team’s first postseason victory. The Bengals shut down All-Pro back Arian Foster in theirfirst matchup, and perhaps that served as motivation Saturday. Foster rushed for 153 yards and two touchdowns, becoming the first undrafted running back in league history to run for more than 100 yards in his first playoff game. The momentum-changing moment came with just 52 ticks left on the click in the first half. After Houston tied the game at 10-all, Andy Dalton dropped back and threw a pass that was snatched up by defensive end J.J. Watt. The rookie returned the interception 29 yards for a score, sparking the Texans' defense. Houston would shut out Cincinnati, 14-0, in the second half. Dalton was picked off twice in the second half, as Wade Phillips’ tenacious defense took advantage of the rookie knowing he had to throw the ball. The Texans next challenge comes in the form of the Baltimore Ravens on Sunday. New Orleans 45, Detroit 28: The Lions were in the playoffs for the first time since 1990, when Home Alone was still in their theatres and “Ice Ice Baby” rocked the airwaves. However, they had the unfortunate pleasure of playing in the Superdome, where the Saints’ average margin of victory is 26 points, 31 at night. In the Saints’ case, numbers never lie. The Lions jumped out to a 14-10 halftime lead, knocking Drew Brees and the prolific Saints offense out of rhythm and dominating their secondary. But certainly it was a tale of two halves. 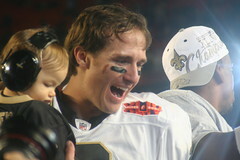 Brees threw for 292 yards and three touchdowns in the second half, propelling New Orleans to 35 points. It would be the fourth consecutive game in which this offense posted at least 42 points. Though Detroit couldn’t find a way to get past the NFC South champs, they set the bar even higher for 2012. For New Orleans, they avoided a first-round slip-up for the second straight year, and they’ll take their high-flying offensive attack to San Francisco, where they'll face the NFL's fourth-best defense. New York 24, Atlanta 2: In what many assumed to be a true toss-up game, the Giants played like a team possessed. Their defense, aggressive and steady, resembled the unit that lifted them to the Super Bowl in 2007. New York’s defense had been heavily criticized this season and deservedly so. Allowing 25 points per game and inconsistent against both the run and the pass, it wasn’t until Christmas Eve when they began to click. The G-Men, who held the Jets and the Cowboys to 14 points each in their final two games, held the Falcons offense to zero. Atlanta’s defense outscored their offense with a safety in the second quarter. Matty Ice looked frozen, mustering up just 247 total yards on offense. The Giants put pressure on Ryan all afternoon with seven quarterback hits and two sacks. For the second year in a row, the Falcons were bounced in their opening game. Like their run in 2007, the Giants’ path to the Super Bowl will go through Lambeau Field. These two teams also met in Week 13, when Aaron Rodgers led the Packers to a 38-35 road victory with 58 seconds left. Denver 29, Pittsburgh 23/OT: If you just tuned into the game at halftime, you probably had to look twice to assure you were reading the scoreboard correctly. Tim Tebow lifted Denver to 20-first half points, more points than the team had scored combined in their last two games. The Steelers No. 1-ranked pass defense allowed Tebow, the much-maligned passer, to complete five passes of 30 or more yards. In 16 previous games, the defense had given up just six. As expected, Ben Roethlisberger,despite playing through a sore ankle, helped Pittsburgh tie the game at 23 with two touchdowns passes and a Shaun Suisham field goal. And for the first time this postseason,we witnessed overtime. The Broncos won the coin toss, and on his first drop-back he launched a missile to Demaryius Thomas for an 80-yard strike. Once again, Tebow had outdone himself. For all the talk over the past few weeks about Tebow’s future as an NFL passer, he proved to be the best quarterback on the field Sunday night. His next shot at redemption: a rematch with Tom Brady, Bill Belichick and the New England Patriots. Next Post: Celebrity Marriage Not So Sacred?